Perhaps nothing better symbolizes American culture’s secondary emphasis on community more than the public political apathy and anemic voter-participation levels of the past quarter century. Though presidential and congressional midterm election turnout among eligible voters has declined only slightly since 1972, Patterson, a professor at Harvard’s Kennedy School of Government, says that the confounding (and depressing) truth is that turnout hasn’t increased, in spite of all the reasons participation should have grown. The 1960 Kennedy-Nixon race enjoyed a 63 percent turnout rate, while Bush-Gore limped in at 51 percent. Political scientists have theorized that a better-educated citizenry should be a more involved one. Yet in 1960, half of the adult population hadn’t finished high school, and fewer than 10 percent held a college degree, while today, one in four adults holds a degree, and another quarter have attended college in some fashion. In addition, less than one third of Southern blacks were registered for the 1960 election, and turnout among women lagged 10 percent behind that of men. Today, blacks vote at the same rate as whites, women the same as men. Throw in the 10 million registrants added to the rolls by the 1993 Motor Voter Act, and you ought to have a recipe for civic participation. Patterson’s book, though, isn’t just another tired lament about the lameness of the American political process. It’s an extension of the Vanishing Voter Project, designed to discover “what draws people to a campaign and what keeps them away.” Patterson’s suggestions for improving the electoral process are distilled from analysis of 80,000 interviews project workers conducted with citizens during the 2000 presidential campaign. Many of the project’s findings aren’t new or surprising; they’re just backed by more extensive data. The public finds the campaign long and tedious. When media coverage of the race decreases, public interest decreases. People would rather hear candidates in their own words than pundits talking about them. They believe special interests drive the political process. They think the Electoral College is unfair. Patterson calls upon the parties to make the primary season shorter and create a system that permits more states to have a real voice in selecting nominees. He says the media should remain skeptical, but should also give politicians credit when it is due, and calls upon the networks to televise extended one-on-one candidate interviews. And he argues that states should lengthen poll hours and make the registration process more voter-friendly. Many of his suggestions would surely benefit the process, but even Patterson admits that his prescriptions can do only so much to enliven democratic involvement. He concedes that, at the core, healthy turnout is inextricably linked to voter motivation. If citizens don’t care enough to vote, the level of procedural ease and efficiency won’t matter. Patterson argues that the lower level of today’s political stakes has naturally reduced people’s interest in politics. He suggests that absent deep social problems, the parties have ceased to argue big ideas, and now largely battle over the means to reach mutually agreed-upon ends. Bush and Gore both wanted to fund a prescription-drug benefit program, but W. aimed to spend $158 billion to Gore’s $253 billion–not exactly differences that lead to shouting across America’s dinner tables. There’s also a generational aspect. “The civic-minded generation raised during the Depression and the Second World War has been gradually replaced by the more private-minded X and Y generations that lived through childhood and adolescence without having experienced a great national crisis,” he writes. Last fall’s terrorist attacks may have given younger citizens their own taste of national crisis, but Patterson seems to doubt that the event will spark long-term enthusiasm for public involvement. His prediction is proving prescient: This July, after Patterson’s book was headed to the printer, the Center for the Study of the American Electorate released a report on early 2002 primary turnouts, and the numbers weren’t good. “Someday it would be nice to report something other than gloom and lament–that somebody was doing something commensurate with the scope needed to reclaim the vitality of American democracy,” said Curtis Gans, the committee’s director. But just like advertising, certain consumers are targeted more than others. Those who aren’t swing voters count less, and consequently, often care less. Such voter alienation hasn’t been helped by the paternalistic condescension from today’s leading politicians. A few years back, Thomas Friedman said that when it comes to leadership, we live in “an age of midgets.” He wasn’t referring to Bush and Gore, but he might as well have been. Patterson says both tried to sell their policy proposals by talking down to their audience. 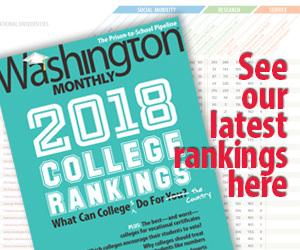 When a computer program designed to assess textbook reading levels was applied to the 2000 debates, it found that Bush and Gore addressed the public on a 10th-grade level, two grades below that of the Kennedy-Nixon debates and three below the national education average. The problem is that strong, dynamic leadership requires taking risk; without it, those charged with leading do little more than supervise. James Carville was speaking about the choreographed nature of national political conventions when he said “boring is good,” but the play-it-safe attitude produces precisely the type of midgets that Friedman laments. As for the conventions, the boring-is-good strategy has produced the most underwhelming of ratings, with only 13 percent of TV households watching the average minute of prime-time debate coverage in 2000. Patterson closes The Vanishing Voter with more optimism, musing that the next few elections might see an upturn in participation, in part from improved civic attitudes since September 11. And for all the misery of the 2000 election mess, it did remind people that their votes count; a CNN poll after the election showed that most people who hadn’t voted wished they had. Perhaps the biggest incentive is that this fall’s races could produce dramatic changes in Washington’s balance of power. Regardless of the turnout in November or in 2004, Patterson warns that without effort, long-term momentum won’t be sustained, concluding that “no stone should be left unturned in the effort to bring Americans back to the polls.” Unfortunately, those stones are more akin to boulders, and at present, the nation is bereft of political heavy lifters.